When I do card reviews, I often refer to different types of collectors. Set Builders tend to collect all base and insert cards. Hit Seekers concentrate on low numbered cards with swatches and autographs. Prospectors tend to collect cards of unproven players with plenty of potential. But in almost every review, I will refer to those collectors with Deeper Pockets. These collectors range from those who are passionate about their collection and dedicate a large percentage of their resources to the hobby, all the way to those who consider buying a few cases of cards merely a drop in the bucket. 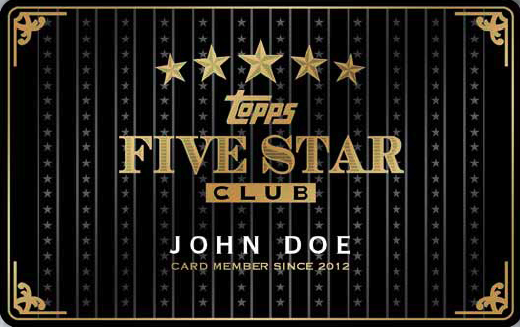 Topps has just developed an exclusive program catered toward these collectors called the Topps Five Star Club. There are strict requirements to get into this club. If you qualify, this is an opportunity you will not want to miss. There are no membership fees to join, but there are eligibility requirements to even be considered for one of these limited, elite memberships. 2 – You must provide evidence that you spend $10,000 or more on Topps product per year. Evidence can include receipts, pictures of your collection, or a specification in the letter of reference from your hobby shop. 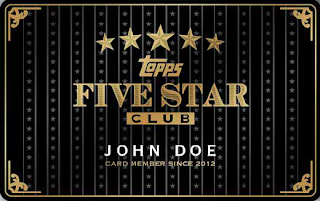 3 - You have to fill out the Topps Five Star Club application along with a 500-word essay explaining why you should be a member of the Club. Memberships in the club will come up for renewal each year. For a chance to be part of the 2013 club, you must complete and submit your application by November 30, 2012, so act fast. For more details about the Club, use this link to download the application.